Mice and rats are the most commonly used vertebrate species, popular because of their availability, size, low cost, ease of handling, and fast reproduction rate. They are widely considered to be the prime model of inherited human disease and share 99% of their genes with humans. Preclinical investigations of the toxicity of a compound represent a crucial step in the drug development process before eventual administration in humans. The OECD Guideline for Testing of Chemicals (423) provides a method to evaluate acute oral toxicity of new drugs. It uses very few animal and is highly reproducible. NEUROFIT has received ethics approval to conduct these studies. 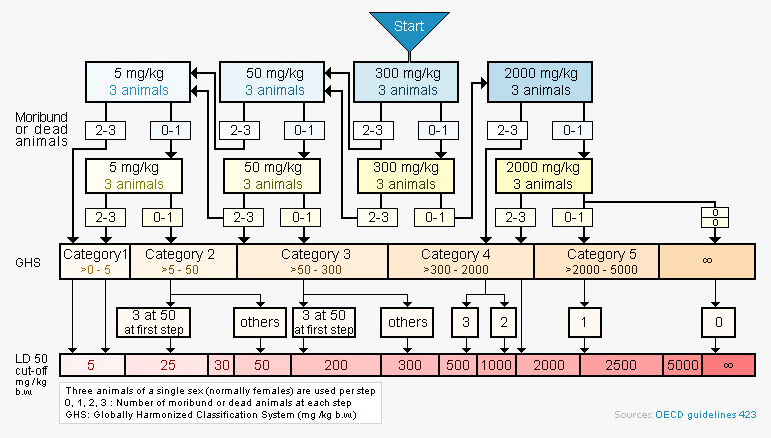 Each step in the protocol uses three animals. The absence or presence of compound-related mortality of animals dosed at one step determines the next step. Lethal exposure ranges are rapidly established and an estimation of an LD50 value can be made when at least two doses result in mortality > 0 % and < 100 %. This model facilitates rapid ranking of compounds within a series, or across series, by their toxicity and provides an informed guide to choosing doses for IND-enabling studies.